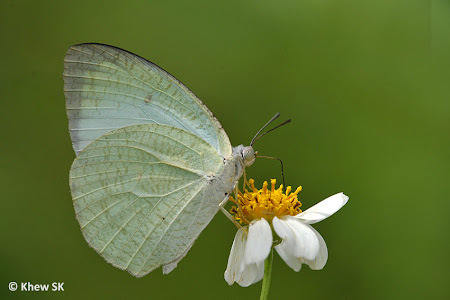 The fast-flying Pieridae is considered common in Singapore. It is regularly seen in urban parks and gardens, particularly where its caterpillar host plant, the Seven Golden Candlesticks (Senna alata) is grown. Wherever there is a healthy bush of the plant, one can often encounter the egg-laying females of the Mottled Emigrant flying around. The life history has been recorded on this blog here. The caterpillar stage of the Mottled Emigrant is short, compared to many other species, with the 1st to 5th instars taking a total of only about 10-11 days. This shot of a Mottled Emigrant was taken when it was feeding on the flower of Bidens pilosa, a common wildflower. The butterfly has a strong flight, and is not easy to shoot, except when it stops momentarily at a flower to feed.